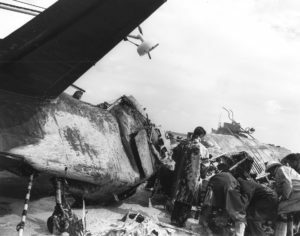 One of the worst military aviation accidents to occur in Rhode Island in terms of loss of life occurred on June 1, 1950, at the Quonset Point Naval Air Station. On that day, a P2V-2 Neptune aircraft, (Bu. No. 122454), left Jacksonville, Florida, and landed at Quonset to refuel before proceeding on to Newfoundland. After the brief stop-over, the Neptune resumed its journey. Shortly after leaving Quonset, a fire developed in one of the engines forcing the pilot to declare an emergency and turn back. As the aircraft was making its final approach on runway 34, a strong gusty cross-wind suddenly caught the wing and flipped it over while still in the air. The plane crashed down on the runway and the fully loaded fuel tanks exploded. The pilot and co-pilot managed to escape through emergency hatches, but the other nine men aboard were killed. Lt. (Jg.) Clarence R. Plank, 25. He’s buried in Evergreen Home Cemetery in Beatrice, Nebraska. Ensign David M. Arter, 23. He’s buried in Lisbon Cemetery in Lisbon, Ohio. Chief Aviation Machinist Mate Francis J. Mc Swiggan, 34. He’s buried in Beverly national Cemetery in Beverly, New Jersey. Chief Aviation Electrician’s Mate Huilette E. Fountain, 29. He’s buried in Elmwood cemetery in Birmingham, Alabama. Chief Aviation Structural Mechanic Clarence A. Thorson Sr., 27. He’s buried in Cypress Grove Cemetery in New Orleans, Louisiana. For more information and a photograph of Clarence, see www.findagrave.com, Memorial #5660419. Chief Aviation Electricians Mate Harvey D. Thomas. He’s buried in Oakland Cemetery in Dallas, Texas. Chief Aviation Machinist Mate John A. Seger, 27. He’s buried in Garden of Memories Cemetery in Salinas, California. 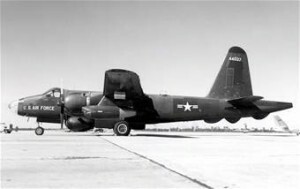 The aircraft was assigned to AP-3 based in Jacksonville. 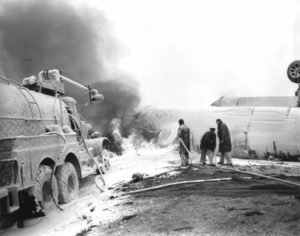 Another aviation accident that also took the lives of nine navy men occurred several years earlier at Quonset Point on December 5, 1943 when a PV-1 Ventura crashed into a hangar and exploded. The details of that accident can be found elsewhere on this website. Troy Record, June 20, 1950.